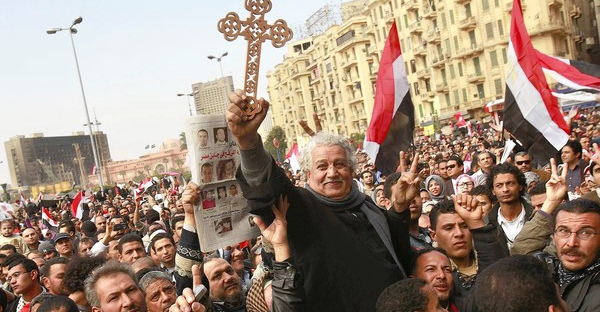 Coptic Catholic Bishops in Egypt have hailed the result of the referendum on the country’s new constitution, saying the document amounts to a crucial step towards religious freedom and other civil liberties for people of all faiths, including the country’s Christian minority. In interviews with Catholic charity Aid to the Church in Need, Bishops Kyrillos William Samaan of Assiut, Upper Egypt, Antonios Aziz Mina of Giza, and Joannes Zakaria of Luxor all praised the result of last week’s vote, which officials say registered a 98 percent ‘yes’ vote in favor of the new constitution which had been drafted under the country’s interim regime. The bishops said that such an overwhelming majority result gave the government a clear mandate to act in accordance with the constitution’s precepts, which are seen as hinging on the principle of granting fundamental freedoms to all, regardless of race, religion, gender and age. The bishops highlighted the contrast between the new constitution and its predecessor, ratified in December 2012 under ousted President Mohammed Morsi, a former top official in the Muslim Brotherhood, and which was seen to assert the rights of Muslims at the expense of the rights and privileges of non-Muslims. The bishops also pointed to the new constitution’s emphasis on women, children and disabled people, protection of whose rights they said were largely absent from the former constitution. The bishops also confirmed that the rights of Christians were well represented in the new constitution. Both Bishops Samaan and Zakaria cited extracts from the constitution highlighting the priority of drafting new legislation governing the construction of churches, a process which until now has been very slow and cumbersome for Coptic leaders. The constitution also paves the way for the election of a new Parliament and a new government and the prelates said that once the changes were in place they hoped the new regime would press forward with the recommended legislation on church construction. According to the bishops, there is overwhelming public support in Egypt for religious freedom. They said that this stance was self-evident in the referendum result which prompted 20 million “yes” votes, a number much bigger than the previous one where the turn-out was lower and only 64 percent were in favor. The Muslim Brotherhood had urged its supporters to abstain from last week’s vote and, quelling fears that the Brotherhood may again react with violence, the bishops said Islamists were now no longer able to resist the momentum for change and freedom. Bishop Aziz Mina was on the commission responsible for drafting the constitution. “This constitution unifies all Egyptians. It is a good constitution because it mentions every Egyptian, including women, children and all the religious groups,” he added. The bishop also highlighted a chapter in the constitution about Egypt’s culture, saying that it specifically makes reference to the ancient Egyptian and Coptic periods, eras until now largely overlooked by Islamists who focus only on the Islamic era from the 7th century onwards.